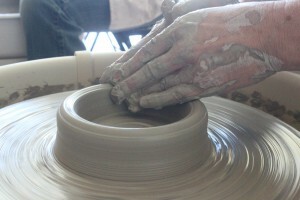 Time and space to work in clay. Do I need experience? Studio memberships are open to anyone, but they are self-directed, so it is preferable if you have prior experience in a studio. 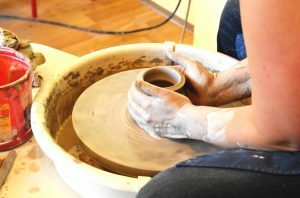 If you are a complete beginner, we recommend you take one of the 10-week classes first to get familiar with the process of working in clay. When can I come in? You can come in to use the studio whenever we are open. Open hours are listed on the Contact Us page. Please note we are often closed for major holidays, and some morning hours are not available in between class sessions, but you can find our hours on the Contact page. Contact us with questions. Are materials included? Clay can be purchased by the 25lb bag. We have 2-3 stoneware cone 6 bodies, and a cone 6 porcelain. Glaze firing is calculated by volume at a rate of 5 cents per cubic inch, and there are volume discounts. This includes use of our 14-16+ shop glazes. How do I get started? Schedule a tour! See the space, meet some students and staff, ask questions! After you are convinced this would be an awesome place to create your work, those who have never been a student at Studio 550 before are asked to go through an orientation about how the studio operates before getting started. It lasts about 10-20 minutes. After this, you are free to play! Please contact the studio with questions or to schedule your tour. Monthly memberships are automatically billed monthly starting on the day that you start. 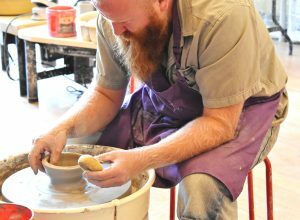 Come enjoy some you+clay time and meet our awesome clay community. Reserve your space here. 5 or 10-Visit Anytime Access Gives you pre-paid passes to the studio that you can use whenever we are open. We do not time the visits, so stay as long as you would like, but if you leave and come back, that would count as two visits. The pass is valid for four months from the day you start. Reserve a 10-visit pass here. Reserve a 5-visit pass here. Drop-in Daily Rate If you have a specific project in mind that can be accomplished in just a handful of visits, then this is the best option for you. We do not time the visits, so stay as long as you would like. Pay per visit. Reserve your space here. 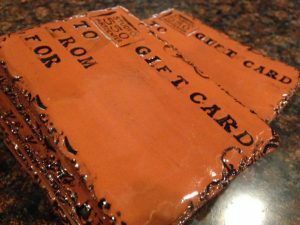 Gift Cards never expire, can be used for any classes, or anything in our gallery. Get a digital gift card, or, if you’d like a really cool physical clay tablet (see image) we can ship one to you. Shop gift card options here.